FY18 was another hugely successful year for TechCollect. 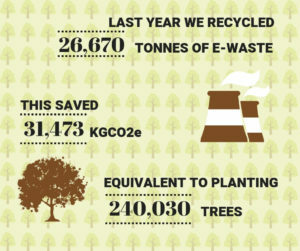 The result of achieving our regulatory targets translated into massive environmental savings. Lifecycle assessment consultants Lifecycles were recently engaged to undertake an independent third party assessment of the TechCollect program. 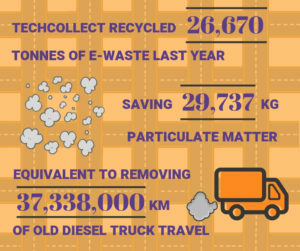 This involved evaluating its environmental impacts across the supply chain, and included a thorough investigation of the collection, transportation, recycling and processing of e-waste across our operations. The data emphasised the benefits of reintroducing recycled materials into the manufacturing stream, compared to relying solely on virgin stock. These insights illustrate how recycling e-waste is the logical and responsible approach for the management of end-of-life products and materials. 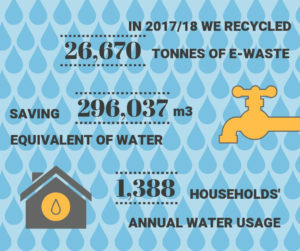 We will soon be releasing an information pack to each of our Members, summarising your organisation’s individual contribution to these environmental savings. 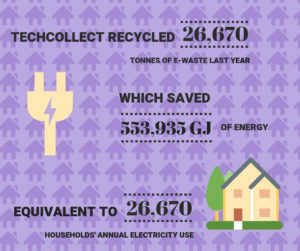 We hope this information will be useful and that you may be able to share these figures to promote your commitment to sustainability and product stewardship.